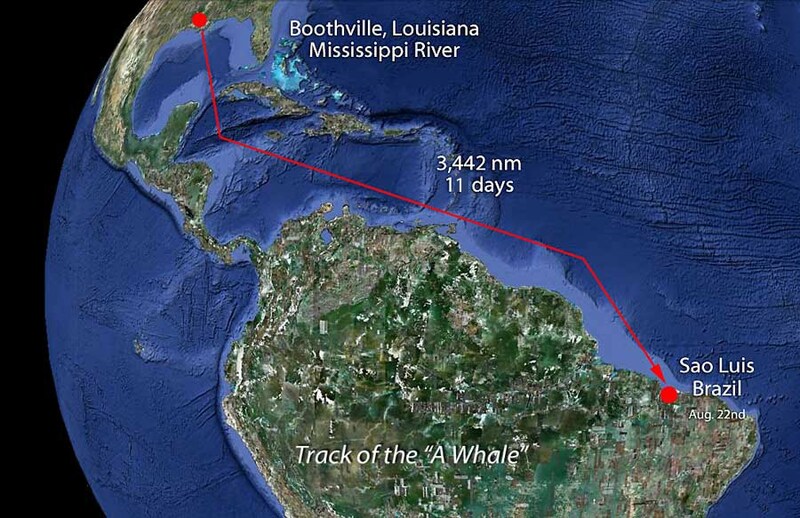 Back in April, when the Deepwater Horizon drilling vessel exploded into flame, a massive oil leak from the reservoir more than three miles below the surface began coating the Gulf of Mexico with Louisiana Light Sweet Crude oil. 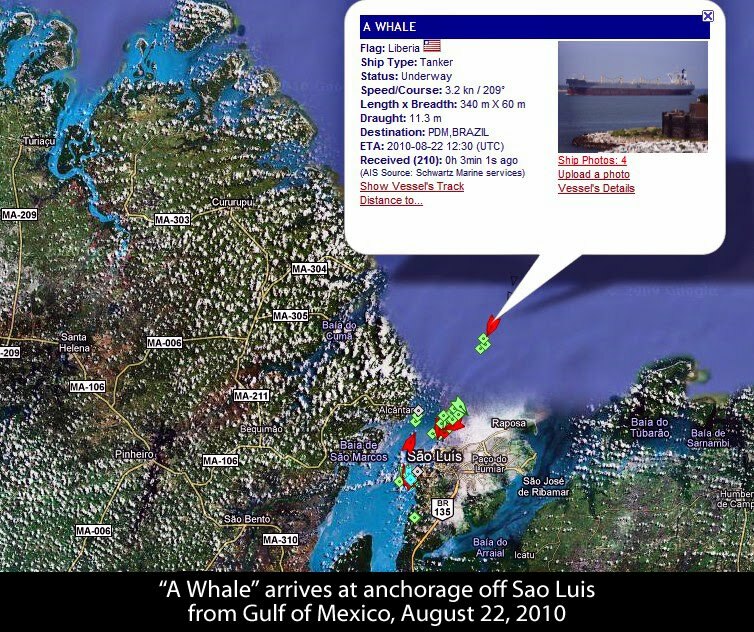 A Taiwanese ship owner, Nobu Su, had just taken delivery of his latest Very Large Oil/Ore Carrier, (VLOO) "A Whale," which was sitting in Brazil, awaiting a loading slot at Sepetiba Bay. 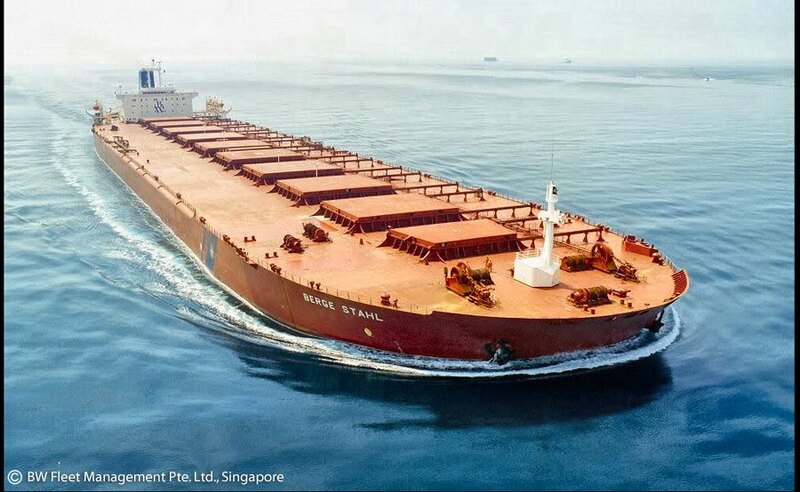 Mr. Su sent his brand new VLOO to Portugal for modification into a "Super Oil Skimmer." While his intentions were noble, the execution was ill conceived. 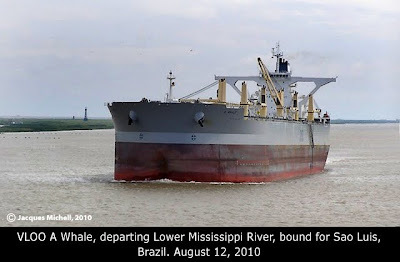 The "A Whale" returned to her upbringing as an oil / ore transport, ending up at Baia de Sao Marcos Roadstead near Sao Luis Brazil. After waiting in line for five days, on August 27th, the "A Whale" was cleared to move to Ponta da Madeira Terminal, Pier 1, to load more than 250,000 tons of iron ore.
Ponta da Madeira Terminal (PDM) owned and operated by Brazil's multinational mining and resource giant, Vale (pronounced "vahl-lay"), located just outside Sao Luis on Marahão Island. 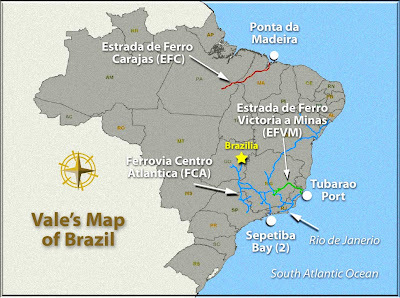 Vale is the former Companhia Vale do Rio Doce (CVRD), whose name change was official in 2007. 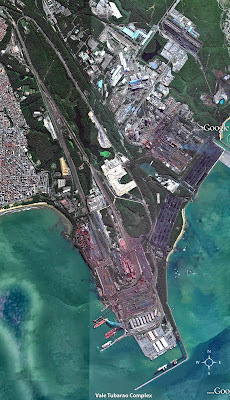 Brazil's deepest loading facility is located at Pier 1. 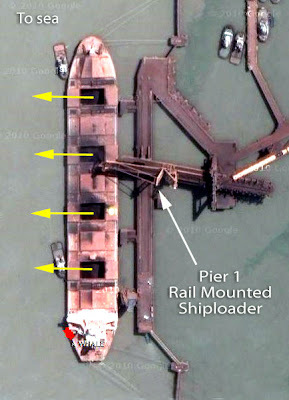 The minimum depth along the docking line is 23,00m (75.5 ft). The "Berge Stahl," one of the largest ships afloat draws 23.5 meters when fully loaded. 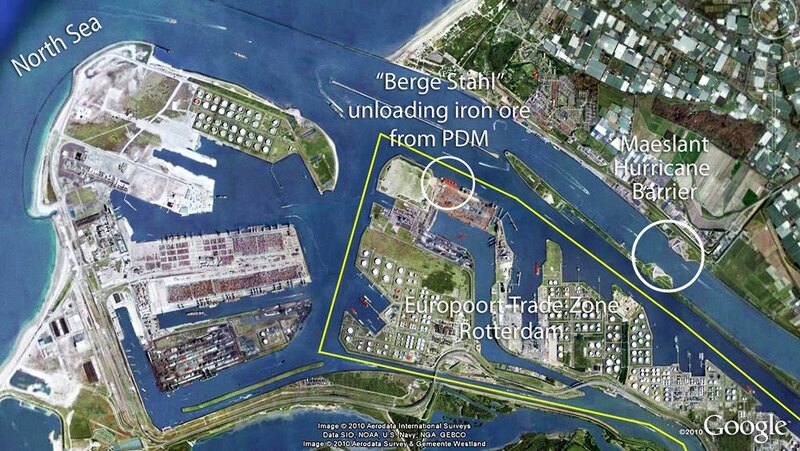 Only two ports in the world can accommodate her fully loaded, PDM and Europoort - Rotterdam. 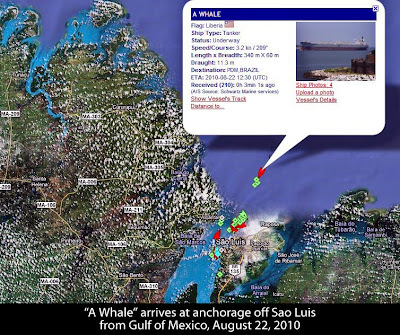 She averages 10 5-week round trips between these two ports each year. Pier 1's Tenaris-ConFab shiploader, rated at 16,000 tons per hour, will take about 24 hours to top of "A Whales" cargo holds. 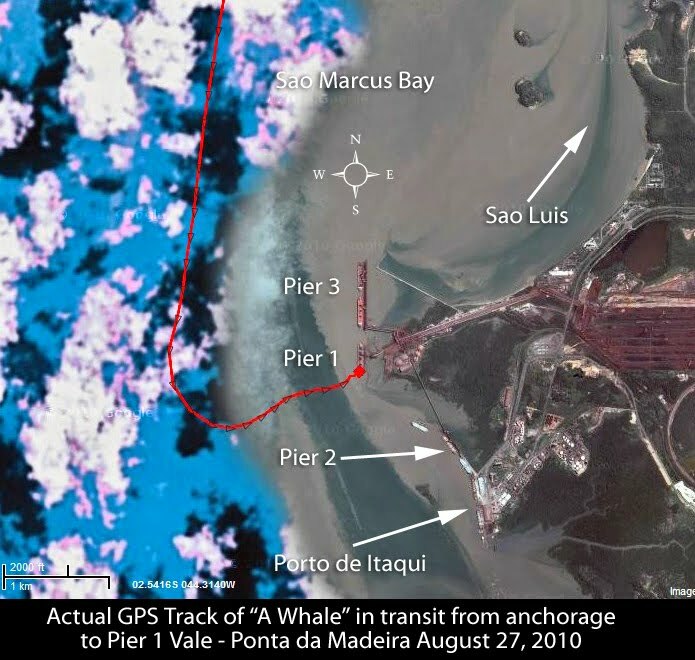 When you think about a ship sitting 75.5 feet deep in the water next to a pier, you really need to visualize the number. That would be like sitting my college dorm building in the water next to the pier, with a little wave action over the roof! 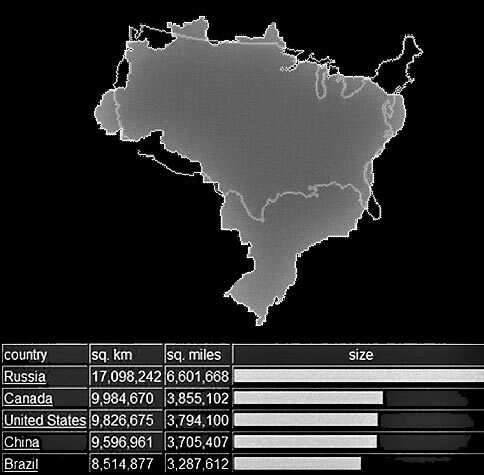 Brazil is rich in many mineral deposits including iron ore. And of course, the development of these resources is intertwined in Brazils history, government turmoil and, surprise surprise, meddling by the United States. In her book, United States Penetration of Brazil,(1977) Jan Knippers writes "World Bank loans had also enabled the Brazilian government to push ahead with the U.S. $500 million road-building project into the Amazon Basin … major benefactors of the Trans-Amazon Highway will be large foreign corporations. She goes on to say, "The Trans-Amazon Highway … will pass remarkably close to the U.S. Steel concession at Serra do Carajas. 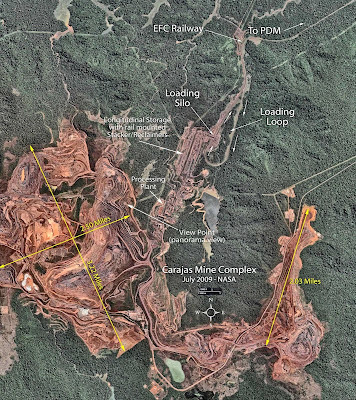 The Serra do Carajas deposits, reported to exceed in quality even the Mina Gerais claims of Hanna [Mining Company], are being exploited jointly by U.S. Steel (49%) and the Companhia Vale do Rio Doce (CVRD) (51%)." 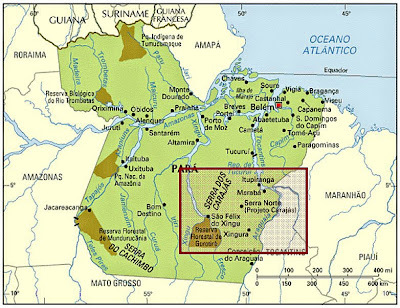 The Serra do Carajas deposits of iron ore were discovered during a survey by American multinationals Union Carbide and US Steel, exploring for manganese in the Amazon rain forest. 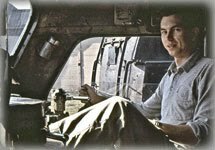 On July 31, 1967, Brazilian geologist, Breno Augusto dos Santos, who was working for Companhia Meridional de Minerações (CMM), a subsidiary of US Steel, was part of a team of geologists who landed in a clearing at the top of the Carajás Mountain range, to refuel their helicopter. 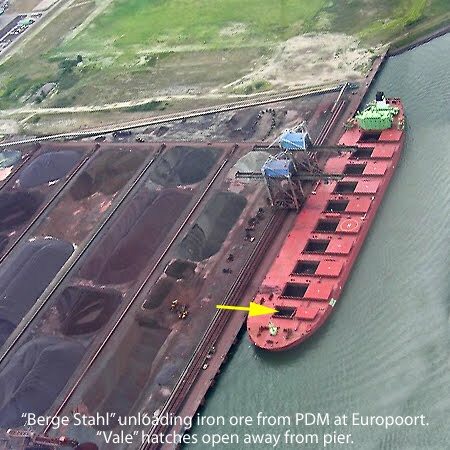 The ground had a visible overlay of iron-ore. Shortly after, the Brazilian government granted mineral rights to the then state-owned Companhia Vale do Rio Doce (CVRD), and the site became one of the largest iron-ore deposits in the world. In 1997, U. S. Steel sold its 49% interest to CVRD. The Carajás Iron-ore Project is situated in the heart of the Amazon rain forest, located between the Tocantins and Xingu rivers, at an average altitude of 650 meters (2,130 feet) above sea level. 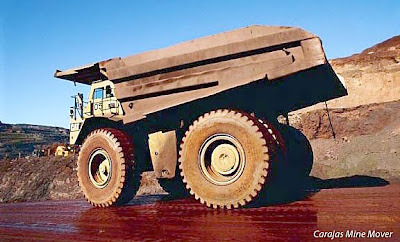 Development of the mine began in 1981. A comprehensive logistical complex; including roads, rail, airport and "company town," Núcleo Urbano de Carajás, evolved from the original mining camp. The current city, built in 1986, occupies an area of 308 hectares (760 acres). 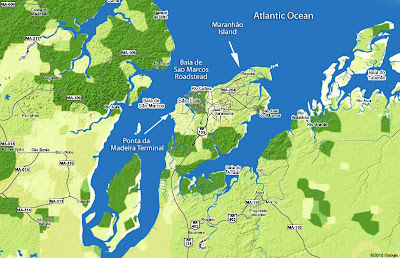 Carajas is 15 km (9 miles) from Parauapebas. The Carajás Airport has regularly scheduled service to the "outside" world. 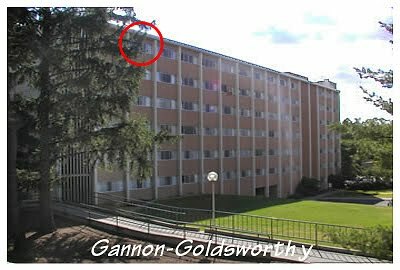 The community provides all the conditions of comfort and security to accommodate a population of approximately 5,500 (2006) employees and contractors in 1,320 housing units, and access is controlled and mostly limited to residents and mine employees. Carajas has a bank, churches, schools, hospital, shopping center, bus system, and, ironically, in the midst of the Amazon Jungle, a zoo! And because it is in the middle of the Amazon Jungle, the complex is completely surrounded by fencing, to keep undesirable creatures (like jaguars) out. 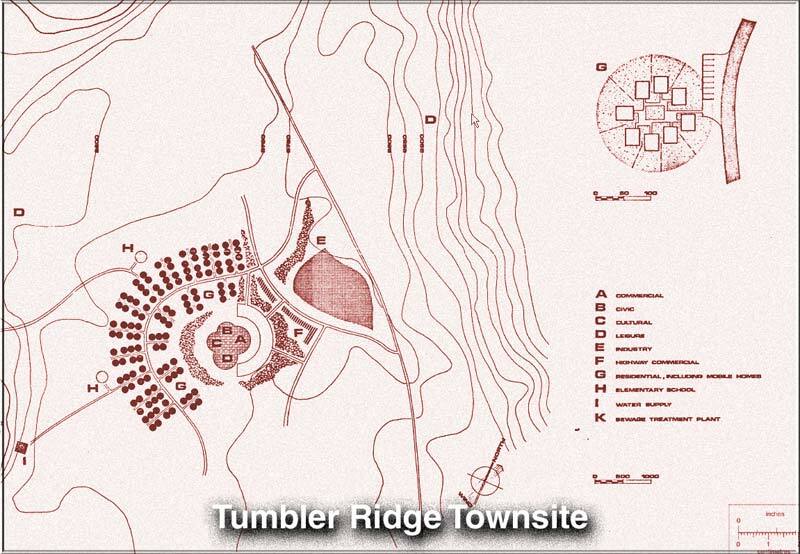 Just like the Tumbler Ridge Coal experience, this town is striking similar to the company town built to support the Tumbler Ridge coalfields in North Central British Columbia. Since most of us cannot imagine what life would be like living in a company town, you may find this study, by Norman Keevil of UBC (University of British Columbia) interesting reading. Ed. 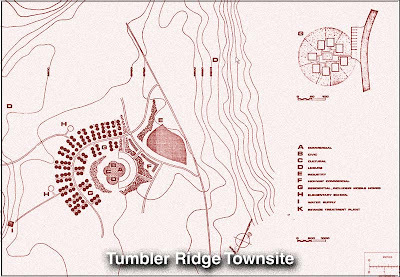 Note: Another example of a company town, Kitsault BC, built by Phelps-Dodge in 1978. An entire city, right down to the appliances in all living units, but never occupied! For sale - if you have the dough and desire to own your own town! 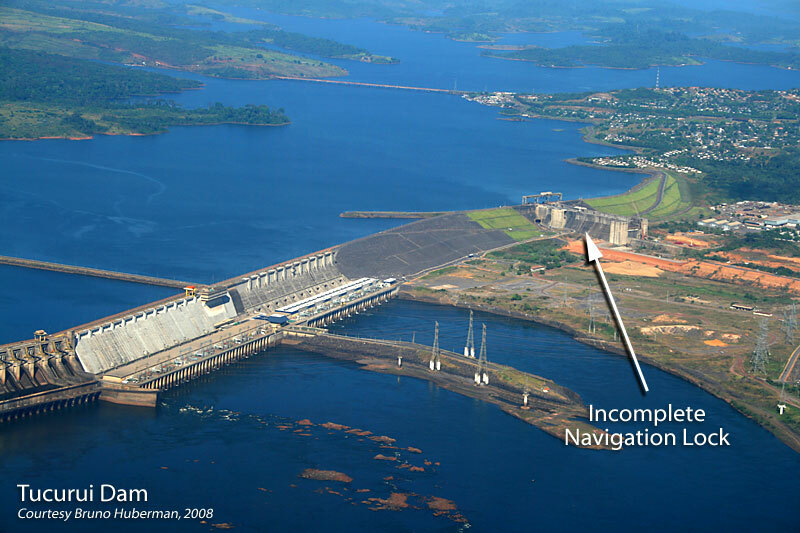 The Tucuruí Dam on the Tocantins River powers the Carajás Iron-ore Project. The installed generation capacity of the plant is 8,370 MW, with 24 generating units. 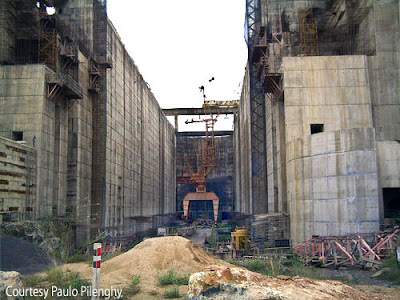 The Tucuruí spillway was the largest in the world with 120,000m3/s of capacity of discharge, until it was edged out in 2008 by the 120,600m3/s maximum discharge of the Three Gorges complex in China. The original plan for developing the Carajás Iron-ore Project included shipping iron ore from the mine by barge to on the Tocantins River to Belém, requiring a navigation lock in the construction of the Tucurui Dam. Interest in and funding for the navigation lock was scrapped, as memorialized by this 2005 photograph by Paulo Pilenghy, visualizing a weed choked incomplete navigation lock. 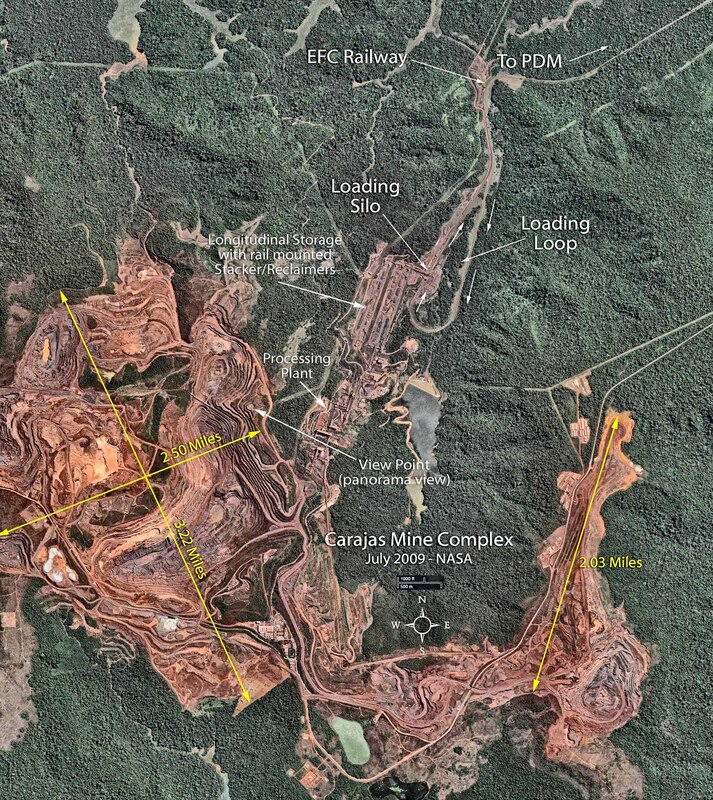 The Advanced Land Imager on NASA's EO-1 satellite took this image of the Carajás Iron Ore Mine on July 26, 2009. Terraced layers of "terra roxa" - red earth, reveal the open pit mining benches. Click on the image above to explore this massive site. Words are hardly necessary to describe the immensity of this project. There are 12 individual images in this highly detailed view of the mine. Everything about this project is massive, from the haul trucks to the material handling equipment in the yard that resemble robotic steel insects from a science fiction movie. 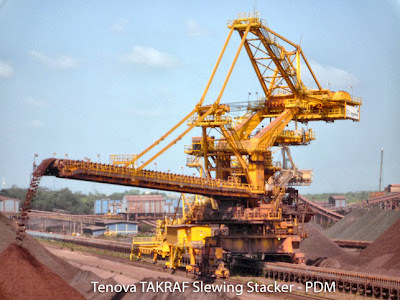 Known as "Stackers" and "Stacker/Reclaimers" these electric powered giants - resembling giant steel insects from a science fiction movie - move amongst the storage piles, connected to complex conveyor systems, operated by remote control from an air-conditioned control room. The first rail shipment from Carajas to PDM to Japan moved in February 1985. In a little more than 24 hours, the "A Whale" had ingested more than 250,000 tons of iron ore pellets, and cleared for departure from Vales PDM Maritime Terminal. On August 28th, assisted by a squadron of Vale's harbor assist tugs, the deeply laden vessel moved out into the Baia de Sao Marcos Roadstead. This is why Vale dictates how hatches open - away from the dock. And with her starboard along the pier, she does not need to be turned, fully laden, in shallow water against fast currents. 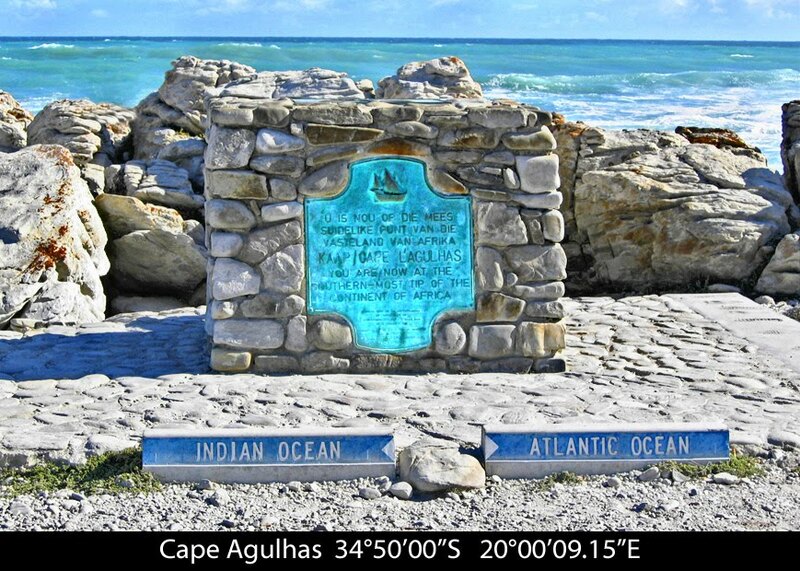 She's alread heading toward the Atlantic. The next day, August 29th, clearing Baia de Sao Marcos, the "A Whale" will cross the South Atlantic, rounding Cape Agulhas,the southernmost tip of Africa. 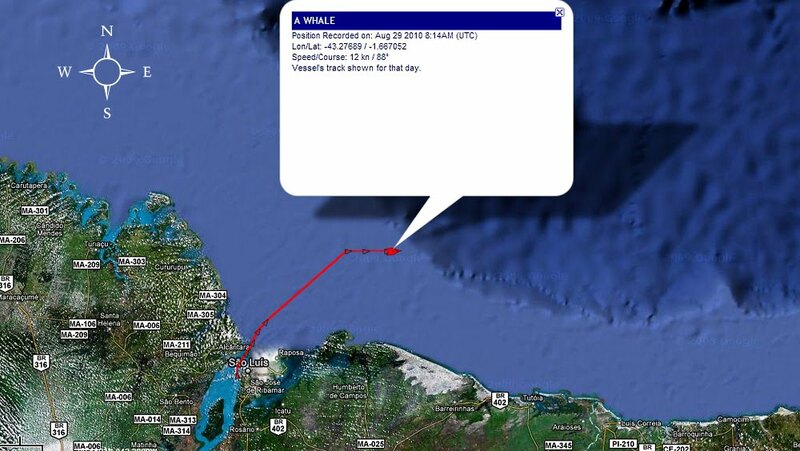 She will cross the Indian Ocean, transit the Singapore Strait, continuing north across the South China Sea to China. 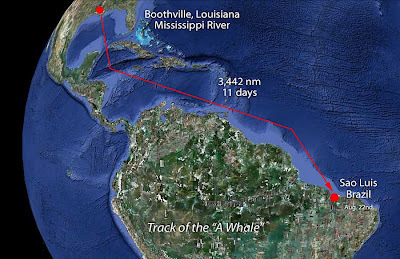 The voyage will cover about 7,600 nautical miles, lasting about 28 days, minimum.